Diego Zarate, Volunteer Recruitment Coordinator of Court Appointed Special Advocates (CASA) of Orange County will speak on the Foster Care System in Orange County and the vital role CASA plays in it. Sunday, April 14, 2019 at 10:00 a.m.
Diego Zarate has been working at CASA of Orange County since April of 2018. He has served as a Case Supervisor, and has been in his current position of Volunteer Recruitment Coordinator since August 2018. 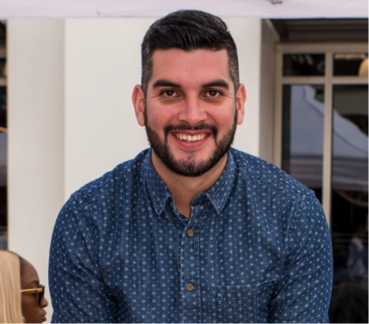 Prior to joining the staff at CASA, Diego spent 2 years working at Big Brothers Big Sisters of Orange County as the Enrollment and Match Specialist . Diego graduated from California State University, Fullerton with a degree in Ethnic Studies and a minor in Kinesiology. Diego has been living in Santa Ana since he was five years old and is the youngest of 6 children. Diego has a focus and passion for helping others and creating opportunities for those in our community who are most in need. CASA is Court Appointed Special Advocates, an organization overseeing volunteers who work one-on-one with youth in the foster care system to both mentor them and advocate for them. The volunteers, known as CASAs, are matched with youth who are most in-need to help them navigate the challenges of the foster care system, to advocate for their best interests, and to be there for them as support while also providing them with opportunities for growth and moments when they can just to be a kid. Come and learn about how CASA is changing the lives of these children and, while there is absolutely no pressure, learn about what it means to be a volunteer with CASA. There are currently over 200 needy children waiting for their own CASA, and CASA is particularly in need of male volunteers (but all are welcome!). Cantor Reinwald is proud to be a current advocate with CASA and will be present to discuss his experience with the organization. There have been several other TBS members who are former CASAs, all who have felt the impact made on these needy children. CASA is a national organization with many local branches throughout California and the country. Read more about CASA at casaoc.org There is no charge and everyone is welcome.